1. 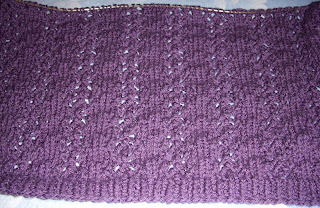 Bonne Marie's CeCe, in Cashsoft 4 ply Eggplant. I got the yarn for a song in the big sale at Knithappens. The body is done, next I'll knit both sleeves at the same time. My goal is to wear this to my 20th high school reunion in August. I'm probably jinxing myself, but I'm not terribly worried about it at this point. 2. Baby Cable Rib sock from Sensational Knitted Socks, knit toe up with a Widdershin-style heel. I'm using some Schaefer Anne yarn gifted me by a friend. Loving the yardage! I divided the skein into 2 equal-weight balls, and it took about 34 grams for this sock, leaving me just over 25 grams left in the first ball. I do believe I'll have enough left over for a pair of ankle socks....fingers firmly crossed. 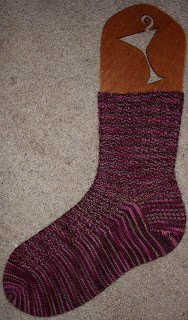 However, I think it will have to wait until after Summer of Socks 2007, as finishing the other sock won't count in my total, and I don't want to risk making a pair of ankle socks and running short on the longer pair. 3. The Knitting Answer Book. When Susie was destashing I picked this up. I really like its compact size, the illustrations are clear and the organization works well for me. I'm glad to have this reference book on my bookshelf. 4. Victorian Lace Today. I ran across this on the shelf at the library and it followed me home. I, like everyone else in blogdom, have fallen hard for this book and must have a copy for myself! 5. Prep for SOS07. I've got my husband's digital scale out of the garage and plan to wind up some balls of yarn tonight to prepare for Thursday's start! Don't want to use up valuable sock knitting time by winding and dividing skeins of yarn. I've been quiet lately as work has been keeping me on my toes. As they say, it only gets worse before it gets better, and this coming week seems to be holding true. But you can bet I'll be casting on a new sock Thursday! All wonderful obsessions! CeCe is looking great; I'm tempted by Ariann and that is definitely on my queue. I even have yarn from the Knit Happens sale for it. Hopefully I'll be able to get to it in fall. I really love that eggplant color too. I just wanted to post a quick comment to say hello and introduce myself as April, your blog reader, for the Summer of Socks 2007. And make sure you know that I found your blog and have subscribed to it. If you haven't already, please take a look at the SOS blog and then shoot me an email to check in.